Is Your Oven Leaking Hot Air? Appliance Rescue Service Can Help! 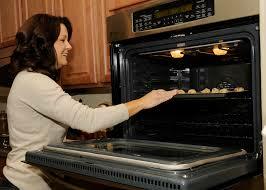 When using your oven, have you noticed that there seems to be an abnormally high amount of hot air leaking out? Is the oven taking longer than normal to preheat? Is food cooking unevenly – or taking longer to cook? These are all signs that your oven may be leaking hot air. If you notice your oven leaking hot air, then Appliance Rescue Service in Dallas, Texas recommends replacing your oven gasket. What is an Oven Gasket? An oven gasket is the seal between your oven and the oven door. It is found around the outside of the oven, generally silver in color and made out of mesh-like material. When this oven gasket gets frayed or worn out, not only is your oven working less effectively, but it’s probably contributing to higher energy costs too! How do I replace an Oven Gasket? 1. Order a New Gasket: Locate your oven’s model number and then search for a new oven gasket on Amazon or at your local home improvement store. 2. Cut the Power: Before attempting to do anything to your oven, be sure to cut all power at the breaker. 3. Locate the End of the Gasket: Look around for the ends of the gasket. They are generally located near the bottom of the oven, inserted into two holes. 4. Remove the Gasket: Once you’ve located the ends, begin pulling them out of the holes. Now, carefully dislodge gasket all along the perimeter. There are small clips holding it in place, so you may need needle nose pliers to remove some sections. 5. Reinstall the New Gasket: Now that the old is out, you can install the new gasket! Simply line up each pin with the existing holes in the oven and begin placing the gasket accordingly. As always, if you suspect an issue with your oven leaking hot air, call us at Appliance Rescue Service in Dallas, Texas! We handle all types of Dallas oven repair, including oven door gasket replacements and more. You can expect fast, courteous, and quality service – and an oven that is back up and running in no time!